Thom Hogan's Complete Guide to the Nikon Z6 and Z7 helps you understand and master the use of the Nikon Z6 or Z7 camera. Both are covered in this 1010 page eBook. You may think that you're well versed on Nikon cameras at this point, but in working through both in putting together this book I found dozens of small changes and differences that are important to know. Nikon's also introduced new features, such as Mid-range Sharpening and Diffraction Compensation, a host of new Creative Picture Controls, and nuances to lots of DSLR-type features. Did you know, for instance, that Highlight-Weighted metering works differently on the Z6/Z7 than it does on the D5/D850? This book covers everything (thus the name). I'll walk you through why the new lens mount is significant, what older lenses you can use with the FTZ Adapter, and how the Z focus system actually is put together and works. Pretty much everything that's known about the Z system is in this book, including why Nikon doesn't want you physically touching the sensor to clean it (that's in a footnote, but it's there). You'll find deep-yet-understandable explanations with more examples and suggestions than in other guides you can buy, all in the no-nonsense and understandable writing style for which Thom Hogan has become famous. No matter how well you think you know the Nikon Z cameras, you'll find things in this work that you didn't know about the Z6 and Z7. That's why it's called a "complete guide." Organized to help you learn. Strongly organized, with distinct sections for what you need to know before using the camera (background and setup), while using the camera (shooting features), and after using the camera (what to do with your images). I've taken the time to re-organize many sections from my previous books, as Nikon's own organization in the menus and options has changed. A complete instruction manual and an introduction to relevant digital issues in one book. 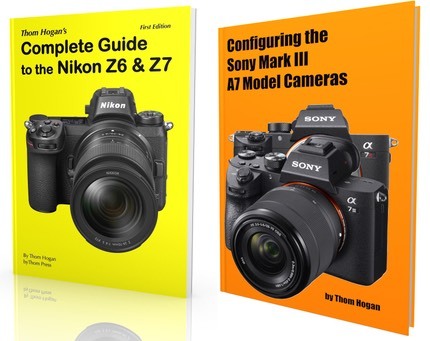 Thom Hogan's Complete Guide to the Z6 and Z7 manages to not only fully describe every feature of the Nikon Z6 and Z7 in clear, easy-to-understand language, but gives you rich, technical background for many of the critical issues that confront digital camera users. First time digital camera users will get information about how digital cameras work. Digital veterans will get insights into how to set their Nikon Z bodies for the best results. Video users get information on how to use the video functions on the Z6 and Z7, including shooting 10-bit N-Log to an external recorder. Z autofocus modes explained in plain English! Nikon loves inventing acronyms and cryptic terms. Can't figure out tracking autofocus, what the autofocus area modes actually do, and how to best configure you camera for focusing? Thom Hogan's Complete Guide to the Nikon Z6 and Z7 explains these terms and accompanying techniques in the same simple, no-nonsense language that made his original Nikon Field Guide a best seller. Video, Focus Stacking, and more are covered in detail. Nikon didn't spend a lot of time in their documentation outlining how everything works. Some of their descriptions are almost as simple as "press this button and turn this dial." Thom's book covers what the camera is actually doing and how that might impact your results. Since the Nikon Z6 and Z7 cameras actually allow manual control of video, you'll learn how to do that, too. The PDF eBook file has been checked and runs on Kindle, Nook, and iPad readers (we suggest the low-cost Goodreader app on the iPad to get the best reading experience, but iBooks works well). Don't have an eReader? No problem, the eBook also works using Adobe Reader on Windows, Macintosh, and Linux systems. Technically, it works on iPhones and Android phones, too, but the screens on those devices are bit small to read comprehensive text. The Complete Guide to the Nikon Z6 and Z7 is a must-own for any Nikon Z6 or Z7 user. There simply isn't any other work out there that comes close to touching the detail, usefulness, or completeness of this work. This product is only available from this Web site. Please don't support or encourage piracy and illegal copying. *Upon clearance of payment. This may be immediate in most cases, but there are payment options you can elect that require confirmation before downloads are available. Please note that the book file is served by an automatic server, and some mail systems tend to put such messages in your Junk folder, so please check your Junk/Spam folder after ordering if you didn't receive an email with the download link. Owners of previous versions of the book were sent an automated link for the updated version on February 13, 2019. Please check your spam/junk file for the email address you ordered from if you didn't see this in your In Box.